Today I spent my second day in the AIDS Clinic. The staff is unbelievably good. The clients who come to the clinic are treated with compassion, dignity and respect. The grace of the nurses and the other clinic workers is something to behold. The clinic had TB (tuberculosis) day today. Many, many patients came to get tested. 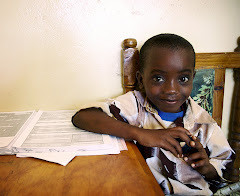 There are several patients, including children, who have both AIDS and tuberculosis. I found out that you cannot get a very inexpensive drug, Streptomycin, in Kenya. This drug is crucial in treating TB and is readily available in most countries. A doctor from the US tells me that the Kenya Government is so unorganized that they did not order the drug even though it is free to get. I feel helpless to do anything, but will write to politicians all the same. Makes you appreciate our system in the US in spite of it's flaws. Many shipments come in to the clinic from USAID. The boxes say “From the American People” and include water bottles, mosquito nets, condoms, and other essentials. Other boxes, including medicine has been arriving from the Clinton Foundation. Makes you proud that the US is trying to do something, but the poverty and disease are so vast, I am sure it does not put a dent into the problem. A valiant attempt, however and pleased that the US is trying to make an impact. I had my first breakdown in the clinic today. Two girls were in the clinic yesterday and we had a bit of a connection (pencils seem to be a universal ice breaker with children). They were back today and I was trying to figure out who their mother was. One of the nurses told me the mother has to go to work so the older sister, age 12 or so, takes responsibility for the younger sister's heath treatment. She forgoes school so she can make sure her sister gets the care she needs. I asked why they were waiting around so long today ( 5 or 6 hours with no food) and the little girl who already has AIDS was being tested for TB as well. I tried to hold it together, but could not. The nurses told me that you quickly have to get over the individual situations to make it through the day. This is one of many situations I have heard about that are unfathomable to most people I will ever encounter. I will spend the day tomorrow at a satellite clinic and then to the “kids club” where they have support groups for children with HIV/AIDS. They do art therapy and other activities as well as giving the children a warm meal. I will be giving out some soccer balls as well. They are a well received gift for the children. I have a few videos but I am not sure the Internet connection is strong enough to send so it may have to wait until I return to the States. One child told me I was a “very good visitor” which gave me tremendous joy. It is hard to feel any contribution one makes will have any impact on such a dire situation, but nonetheless I will not stop trying.